Alex Proyas' Dark City opens in spectacular fashion, zooming in the window of a hotel in a futuristic city that looks older than the seedy live-ins that exist in our time. Inside, a man lies asleep in a bathtub as a rickety light swings over the room, illuminating its sick-green tiles and casting them in darkness once more. The man awakens, less familiar with his surroundings than even the audience. Next to him is the brutally, ritualistically murdered corpse of a woman. This disorienting opening, made satisfactorily more bewildering by the director's cut, which removes the enforced voiceover that spoiled some of the mystery, sets the tone for the most intelligent blend of forward-thinking sci-fi and nostalgic film noir cues since Blade Runner. Its cast of characters bears the off-kilter yet strangely identifiable characteristics befitting Old Hollywood types, from Rufus Sewell's alternately wide-eyed and steeled protagonist John Murdoch to William Hurt's Inspector Frank Bumstead, a pastiche of hard-boiled, lonely detectives. Most memorable is Keifer Sutherland as Dr. Schreber, a breathless bundle of nerves whose skittishness becomes evident when we learn his purpose in the film. Schreber aids a group of alien parasites known as the Strangers, who inhabit the bodies of corpses and have chosen humans as test subjects in their attempts to preserve their dwindling species. They force the frail, obsequious Schreber to program memories for the humans of their city, which we learn is a construction of their telekinetic minds. Every midnight, the Strangers halt everything -- the cars, the trains, people -- to imprint the new memories and redesign the entire city before resuming the next day. As such, Dark City naturally works as a cyberpunk iteration of Plato's Allegory of the Cave. Murdoch, who awoke in the middle of his "tuning," is the prisoner freed from the shackles in the cave, capable of seeing the creatures that form the shadows he and everyone else accepted to be real. As such, he is unrecognized to his wife, Emma (Jennifer Connelly, who mercifully receives more screen time in the longer cut and uses it) and Bumstead, who knows something isn't quite right about the world around him but is unable, or unwilling, to put his finger on it. Proyas has a fine knack for letting the incongruities of this world pile up gently until we are unable to view it in the same manner as we did in the start. As Murdoch flees the crime scene in the hotel room, the clerk demands payment for the three weeks Murdoch has stayed there, which he of course doesn't remember. When Bumstead arrives to investigate the scene, he interrogates the clerk on-hand, who recalls elements of the conversation between himself and Murdoch that confirms the man to be the person who spoke to John earlier even though the gruff white man we saw earlier has been replaced by a calmer black man. As Murdoch no longer falls asleep during the tuning process, he can see the world morph around him; the only constant is the Strangers' lair, a vast auditorium with an unsettling aura not too different from that putrid green that tiled the bathroom at the start. There, the amassed Strangers buzz like the bugs they are, chattering away in mounting fear as Murdoch's ability to resist and fight back against them grows. Aesthetically, the film draws, as has been mentioned already, from the world of film noir, particularly Fritz Lang, whose sci-fi epic Metropolis informs many of the establishing shots of the city. Yet the biggest influence appears to come from the paintings of Edward Hopper. I've always been fascinated with Hopper, before I cared about film and long before I gave traditional art a chance: he started producing noteworthy works around the turn of the century and continued through his death in the '60s, but I always think of World War II when I see one of his works. Even when he depicted multiple subjects in one painting, Hopper captured a feeling of ineffable loneliness (which he purportedly never sought to express). When I look at his most well-known work, Nighthawks (the biggest influence on this film's look), I see not only the space between the few characters in that diner that's already set against the emptiness of the city street around it, I see that era. Everyone was fighting in World War II or working in a factory, leaving behind the old and the infirm to putter about alone. In one of the talking heads accompanying an episode of Band of Brothers, one of the surviving members of Easy Company mentioned how two men in his hometown were denied by the Recruiting Center for flunking their physicals. They committed suicide rather than face the shame of staying. I think of that now whenever I look at Hopper, and his cool, cinema-tinged paintings make me sadder than the most tortured portrait. Dark City operates in much the same fashion. Few people roam any given scene, separated by the constructs of their gods. That open on the hotel window, a fishbowl-shaped oddity (and a recurring image), establishes the entire world as nothing more than a plastic prison for the aliens to gawk at and study the subjects within, and the image of the round window is contrasted with a later shot of a projector lens that throws up slides from Murdoch's manufactured childhood. This juxtaposition, between the audience (and, we can assume, the Strangers) looking in on John through the hotel and John looking at "himself" by way of a past he does not remember because it is a lie, gives the Hopper-influenced visuals an air of desperation to complement the solitude. Consider the scene where John and Bumstead converse: John gets through to Bumstead's feelings of unease by asking when he last saw the sun. This is such a noirish world that no one ever even gets to see daylight. Only the faint "memory" of sunny Shell Beach, which everyone knows but no one recalls how to reach, gives anyone the impression of experiencing the day. 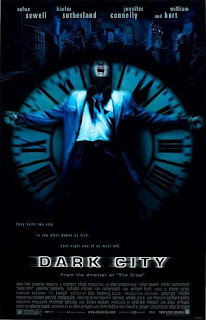 Dark City came and went a year before The Matrix hit theaters and changed, well, damn near anything, yet one can easily see the film's effect all over the Wachowski brothers' blockbuster. The Matrix borrows from the film's tone, aesthetic and narrative. Both villains rely on humanity for their survival, but the computers who control the Matrix resent mankind and exploit them solely as a power source; however, the parasites who inhabit dead humans -- the agents who enforced the Matrix's protocol could pop into any human plugged into the program, remember -- try to figure out the human mind in an attempt to unlock their own mysteries. They cannot afford to revile mankind. Like Neo, Murdoch becomes the new force in this world, but where Neo used his powers to lead others out of the cave, Murdoch cannot lead the citizens of Dark City to safety -- where are they to go in the middle of space? So, he becomes the new demiurge, the shadow-caster for the rest of the prisoners. He does not liberate this world because it first needs to be stabilized, so he hits the reset button and attempts to give this world a normalcy its residents can accept. This level of doubt, humanized by the cautious re-beginnings of John and Emma's relationship, vastly outweighs the sense of optimism unfairly awarded to the end of the final installment of The Matrix, wherein the same unanswered questions of mankind's future are posed yet for some reason we're left feeling everything will be A-OK. That willingness to leave a question unanswered and not to lie to us about it, combined with the superior visual invention over mere trickery, elevates Dark City over its more successful progeny, and it stands as one of the most sadly under-appreciated works of its era. Thank God for Roger Ebert or we might all still be in the dark. You just love meintioning Roger Ebert, don't ya? It's cool, I don't care. I just think it's funny that you agree with him so often. This does seem like an alright film, like the entire picture is meant to represent a depressed person that won't recover, but that doesn't automatically make them suicidal. This disorienting opening, made satisfactorily more bewildering by the director's cut, which removes the enforced voiceover that spoiled some of the mystery, sets the tone for the most intelligent blend of forward-thinking sci-fi and nostalgic film noir cues since Blade Runner. Nicely stated. The opening is one of the best things about the movie, and it's funny that this film and Blade Runner both share a similar look AND similar problems with voiceover narration that is rectified by their respective Director's Cuts. I too loved Sutherland's Peter Lorre impersonation. And I'm glad you mentioned Hooper's influence on the film. Great insight there. The funny thing about Proyas' film was it was filmed in Australia like the The Matrix was, and the Wojo Bros. even used some of Proyas' sets for their film. I remember being a junior in high school when this came out and trying to convince everyone that Dark City (and for that matter Strange Days) was the better sci-fi/neo-noir film. You're right: if it weren't for Ebert's championing of this film it might of never had a chance. Great, insightful essay, Jake. As always you have offered up a nicely written and thoughtful analysis of a great modern film. I really like this flick, and of course another great piece here from you Jake. I absolutely couldn't agree with you more as far as to the superiority of the Director's Cut, particularly in relation to opening. I love it when a film thrusts you right into the muck of its world from the get go, challenging the viewer to piece together what's happening without the benefit of context. In that way I find the subtraction of the narration in the Director's Cut a huge difference, as it forcefully engages the viewer into active participation right away. If there's anything I hate, it's a movie that holds my hand. Let me do the hard work! I never mind anyone bringing up Ebert, I love the guy, and in the case of Dark City, it's almost a necessity. As has been previously mentioned, his high praise was integral to bringing awareness to the film. His commentary track is also highly interesting and informative. Spencer: I mention other critics when it's relevant to my own reaction or re-evaluation of a film. Had it not been for Ebert, Dark City would have been quietly pillaged by the Wachowskis and relegated to obscurity. It's still a cult film, but Ebert's thorough championing of the film (I believe it was the most recently made film added to his Great Films series when it got in), and it's precisely because of him that I ever saw it. I try to limit any actual quoting of another person's review unless I'm either countering it or building off that statement in a different way. Kevin: I also find it a bit amusing that it takes from Blade Runner (though certainly makes its own unique stamp) and it suffered from similar studio impositions. I remember seeing Guillermo Del Toro in the stunning documentary made for BR's big re-release defend his love for the original version, but while I understand that the narration enhances the noir feel I just find it all wrong. Likewise, as brilliant as the theatrical iteration of DC is, it loses something by softening the disorienting effect of the opening by placing no faith in its audience. The genius of the film, its aesthetic suggestions and sure-handed pacing, is far more evident in this cut. I certainly don't think The Matrix is a bad film, of course (I actually saw the Blu-Ray on sale and I might pick it up because I haven't watched it in forever), but it's tainted by sequels that cannot be separated from the first ("original" may be too generous) because they continue the definite story arc and provide answers, albeit awful, wheedling ones. I also think there's more imagination with a lot less money here than the more action-oriented grab-bag of various, thinly explored philosophies. Drew: I love Ebert's commentary track and it's my favorite of the ones he's recorded. Just watched this again recently. Glad to see this post, Jake. I love this movie. Yeah, and I remember when Ebert picked it as his #1 film of the year. I love the film's expressionism and its Metropolis elements. I missed this in theaters - damn, I remember ALMOST seeing it one day! - but I got it on DVD right when it came out. Great review - I admire how much work you put into your blog! Thanks Hokahey. If you have a Blu-Ray player, I'd highly recommend the upgrade. The city's grime looks better than ever and, though the image is a bit smoothed, it easily trounces the SDVD versions (plus, it contains both cuts in one easy package that regularly sells even in stores for less than 10 bucks). Hey! Does the frequency of your posting depend on something or you work on blog articles when you have a special mood or free time for that? Many thanks in advance for your answer.